It’s that time of year again…celebrating the best that Devon has to offer in the County Show at Westpoint. We have been helping out Liz Oram of Love Local www.love-local.com with her fantastic showcase of local artisan businesses with whom she has created living spaces for inside and outside the home in the huge craft and garden marquee. In the marquee entrance, we created a beach scene with deckchairs, bunting and a windbreak made from our upcycled sailcloth and marine canvas range…life’s a beach! You are then drawn into a beautiful garden, the inspiration of Jacquie Michelmore of Lookout Landscapes (jm@lookoutlandscapes.co.uk) centred around a Blackdown shepherd hut, complete with sheep! The trees have come from the South Hams www.newwoodtrees.co.uk and wildflowers from Plantlife finish the scene. The rest of the Love Local rooms have been built in the last few days and show a kitchen from Barnes of Ashburton, living room with sofas by Woodbrooke Ltd www.woodbrooke.co.uk, hand-made furniture by Nick Gant www.facebook.com/NickGanFurnitureMaker and a bedroom with double and day bed from the Cornish Bed Company www.cornishbeds.co.uk. All of the room scenes are dressed with art, ceramics, soft furnishings and lamps by local artisans who support the Live Local, Love Local, Buy Local ethos at the centre of Liz’s campaign to champion the West Country. Cream tea on the lawn this afternoon to celebrate the relaunch of The Beach House Exmouth as a beautiful large group accommodation holiday destination www.thebeachhouseexmouth.co.uk . The house is built in classic Arts and Crafts style dating from 1896 and is a stone’s throw from Exmouth’s wonderful 2 mile sandy beach. It sleeps up to 20 people in 10 double bedrooms and has been completely refurbished to a high standard, with sea views from many rooms. Outside there are lovely grounds laid out overlooking the sea, a large terrace for Alfresco dining, a seasonally heated swimming pool and hot tub. The Beach House has been a project for two families – The Bridge Family run the local Edge watersports centre www.edgewatersports.com and Steph Bridge is 5 times world kitesurfing champion. Eric runs the business and their 3 sons Ollie, Guy and Tom are also champion kitesurfers. The other family owners is the Bowen family who run nearby Pebblebed Vineyards www.pebblebed.co.uk – Geoff and Anna and their two daughters Martha and Jessie. Geoff is a great supporter of local businesses and events and a friend of Sails and Canvas, so when he popped into the sail loft a few weeks ago and spotted our steamers chairs with upcycled sailcloth cushions, he thought they would be the perfect poolside addition for The Beach House…and don’t they look fantastic! Upcycle and recycle…the steamer chairs are a great example of both! The frames were dropped into the sail loft with the question “do you think you could make use of these?”…we didn’t need to be asked twice! And the upcycled sailcloth on the seat cushions looks happy to be having a new lease of life near the water again! 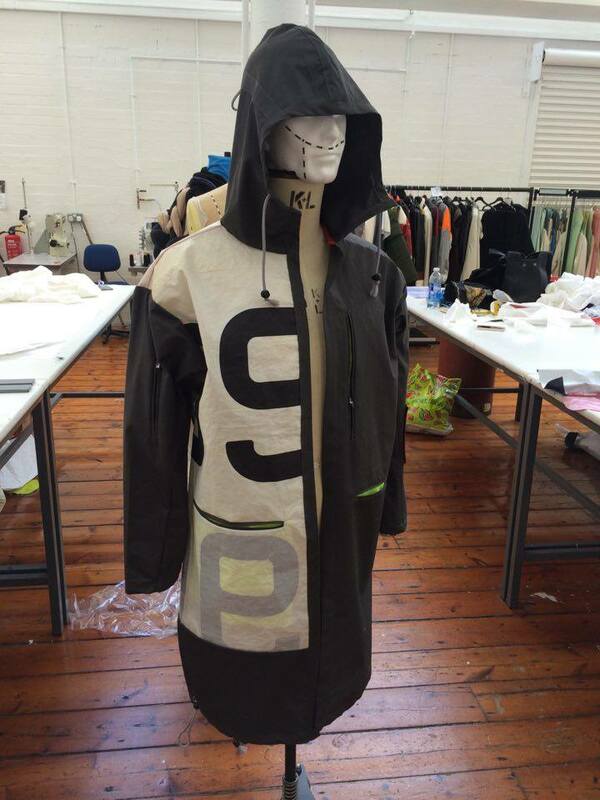 Last year we were contacted by Charlotte Heley, a second year Fashion Design student at the University of Leeds. She was designing a sustainable sailing inspired menswear collection and needed some sailcloth to use as samples in her portfolio project…we love a bit of upcycling, so we sent her a couple of metres of laser sail and wished her luck. Just look at what she’s done! The brief was to design a collection of sports inspired fashion garments for a designer of their choice. Charlotte chose Christopher Reaburn as her “hypothetical designer” as he specialises in remaking discarded textiles into high quality fashion garments www.christopherraeburn.co.uk/about. She took this philosophy and based a collection on sailing, using the laser sail we sent her in a number of designs. Charlotte then went on to make the parka and it looks fantastic! There may be a career at Sails and Canvas for you when uni is done!!! Staying with all things art and design, from Friday 13th May – Sunday 16th May our sail loft will be part of Exeter Open Studios 2016. Exeter Open Studios (EOS) is an artist-led art festival of creativity, showcasing work by local artists living and working in Devon www.exeteropenstudios.co.uk. Artist Caroline Hart has her sail loft studios upstairs at Sails and Canvas and it is home to Wallpaperboats www.wallpaperboats.co.uk. She creates map and marine chart navigation based paintings, drawing inspiration from our beautiful location on the Topsham quay. This is the second year that Caroline and her friend Anthi Kay, a ceramics designer, have taken part in EOS and with over 300 people visiting the studio last year it could be a busy time in Topsham’s creative quarter next weekend! We’ll be open at Sails and Canvas too, so come and say hello to all things Sails and Canvas and all things Art and Design.